Have you heard of Rational’s SelfCookingCenter®? If not, we invite you to carefully read on! Let us introduce the food preparation world leader for commercial kitchens! Rational’s adventure began in 1976 when they though of combining steam and heat into a single unit. Still being improved today, the first combination oven was born. Customer satisfaction and rigorous manufacturing standards are a priority for this German born company. Born in 1973, it employs over 1800 collaborators around the world. With its pioneering intelligent cooking features, simply place your dish in the SelfCookingCenter®, program the desired results, and wait! No need to constantly adjust temperatures, humidity, or cooking speed. The unique combination of heat and steam allows grilling, searing, baking, steaming, and poaching, all within a single unit! Cooking parameters can also be adjusted manually. 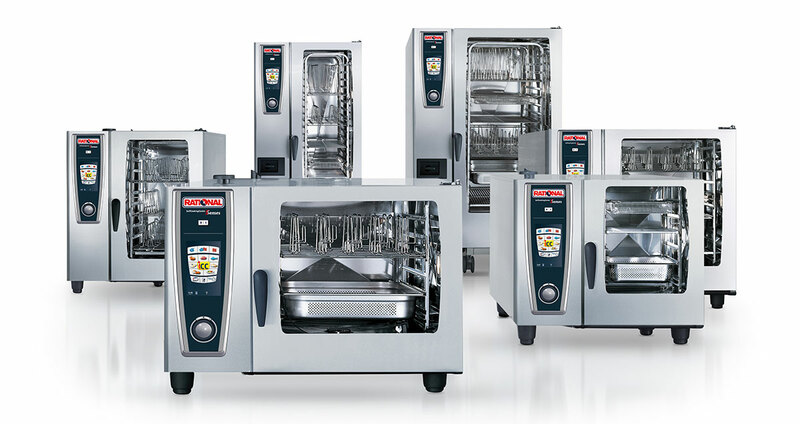 Several functions have been added to Rational’s wide range of large combination ovens. In addition, a more compact generation of units is now available. Indicator light that allows you to know when food is ready, by level. The smallest unit of the SelfCookingCenter® family, the XS, perfectly complements larger units for commercial kitchens and caterers, and is suitable for supermarkets, specialty food stores, small restaurants, and convenience stores. The 21 x 26 x 22 in. unit features an integrated steam generator and many more innovative characteristics. It is the only compact combination oven featuring this technology in North America. The steam generator automatically descales during the self-cleaning process, and steam saturation ensures perfect cooking results. If you haven’t purchased your Rational cooking system yet, we invite you to come visit our showroom to test and experience their power and efficiency. Come discover Rational with one of our experts, obligation free, or visit our website for more details. Our Boucherville and Quebec showrooms offer free, obligation free demonstrations. To plan your Rational demonstration, visit our events calendar here.